***These knives have been modified by the KnivesPlus Team. We take great care in our modifying process to guarantee that they function as intended. Some of our modifications include acid washing, anodizing, regrinding, and customizing backspacers. ***Please note that occasionally, modifications can void the manufacturer warranty. 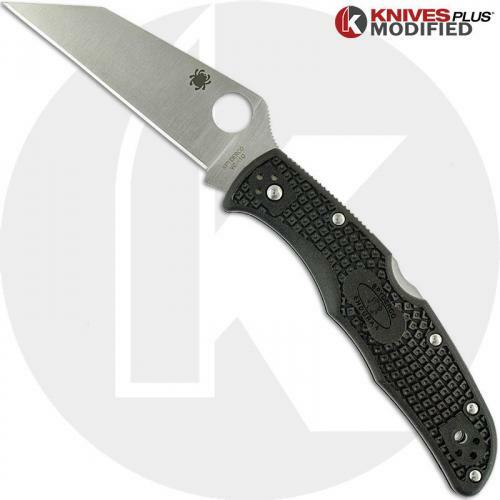 The MOIDIFIED C10FPWCBK Spyderco Endura 4 REGROUND Wharncliffe Knife features a 3.78 inch REGROUND Wharncliffe blade made of VG-10 stainless steel, .118 inch thick, with a full flat grind, a notched thumb ramp for secure grip, and the Spyderco hole for ambidextrous one hand opening. 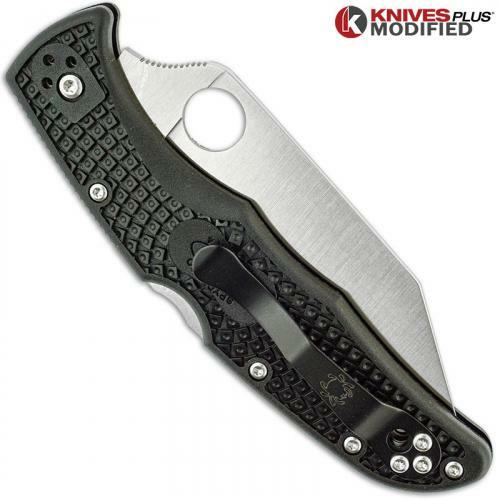 The black FRN (fiberglass reinforced nylon) handle, 4.98 inches closed, has Bi-Directional Texturing for secure purchase, a lockback, a lanyard hole and a four position steel pocket clip. 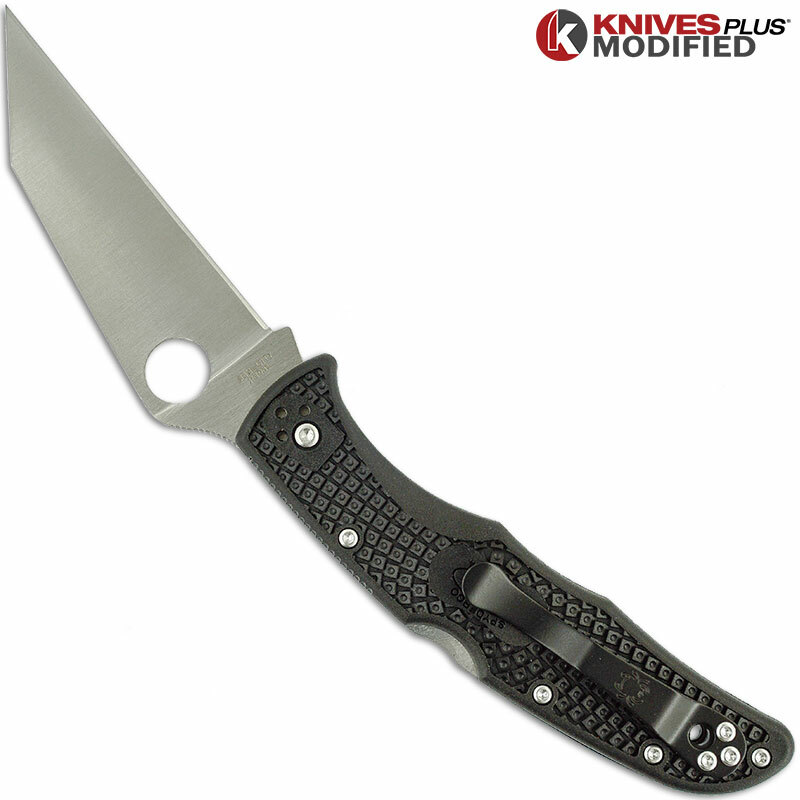 The Spyderco Endura 4 Wharncliffe Knife has an overall open length of 8.76 inches and it weighs 3.4 ounces. Made in Japan. From the Spyderco website: Spyderco's Endura 4 Lightweight has achieved near-legendary status in the world of everyday-carry cutting tools. The latest variation of this iconic model furthers its enviable reputation by combining all the best-in-class qualities of the standard version with the extreme cutting power and versatility of a Wharncliffe blade. The perfectly straight cutting edge of the Wharncliffe profile cuts with full power along its entire length, enabling it to tackle extreme cutting chores and detailed work with equal ease. Available in either a PlainEdge™ or fully serrated SpyderEdge™ format, the VG-10 stainless steel blade features a full-flat grind for low-friction edge geometry that further accentuates the advantages of its Wharncliffe design. 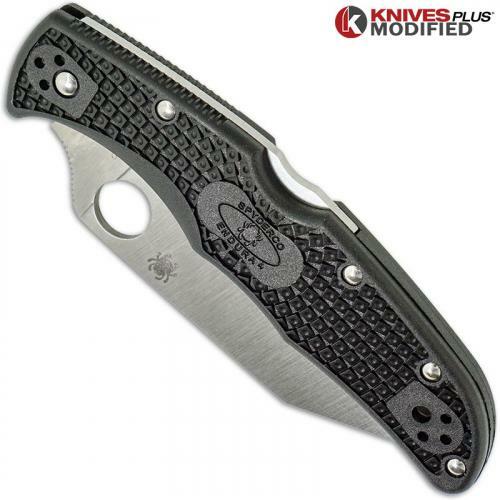 A fully accessible Trademark Round Hole™ proudly announces its Spyderco lineage and provides swift, ambidextrous, one-handed opening. The high-performance blade is backed by a lightweight, ergonomic handle that includes a sturdy back lock mechanism, skeletonized stainless steel liners, injection-molded fiberglass-reinforced-nylon scales, a high-traction Bi-Directional Texture™ pattern, and a four-position pocket clip. Proof positive that even the best tools can be made better, the Endura 4 Wharncliffe sets a new standard in high-performance folding knives.